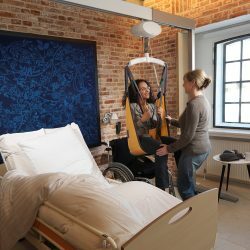 Ceiling-mounted hoist systems are often an ideal solution for lifting and moving people from one place to another in all kinds of care environments. With the lifting equipment mounted out of the way on the ceiling, you keep the floor space uncluttered and it is much easier, quicker and safer to get around. Lifting systems of this kind can normally be mounted in virtually any indoor space and reach anywhere in any room, with furnishings and floor coverings no hindrance. This approach also saves you time, as everything you need for effective lifting and moving is always in place, charged and ready to use as soon as it is needed. The result – more time for the care that really counts.